Yeah the wife and I were there just last April. Good timing. I can see the old structures being a powder keg though. Live feed. The spire is lost. The president of the US just suggested flying water tankers be used to help. Steve Bannon is over there stirring the pot. Maybe he could help? The spire collapsed... THis is horrible. *facepalm* Yes, let's dump thousands of pounds of water at 32 ft/sec on a thousand year old relic that will surely save the structure! Explosives put out fires too. At this point the building is gone. You'd be doing the action to put the fire out. Instead it seems they're content to let it all burn to the ground. And with a roof fire, as it collapses, it'll take it all to the ground. Trying to save the stone structure now that all the wood is burning, it appears. Save the bell towers and everything around them. The main rose is there. 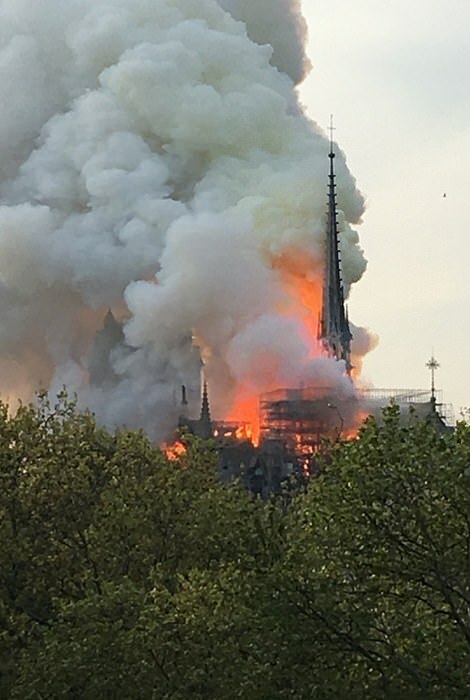 This is just a tragic loss of history and culture. Yeah I mean if you have to choose only one piece to save, definitely the front. My favorite sculpture on earth is the Last Judgment above the entrance.